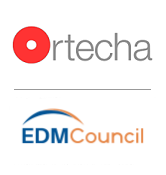 Ortecha’s Gareth Isaac is leading, in collaboration with Mark McQueen, the EDM Council’s Critical Data Element (CDE) Best Practice Working Group. The issues surrounding the designation and management of critical data elements ranked as the number one priority in the 2017 benchmarking study conducted by the EDM Council, so this working group is clearly needed to standardise this important area of data management. Findings will be published soon. This entry was posted in News and tagged best_practice, cde, edmcouncil, gareth, standards.